Amazing work! It really evokes the tragic feeling of the poem, and gives you the gothic feel as well. I love it so much I’m going to show it to the kids I teach! Lovely work… nicely done… esplly. 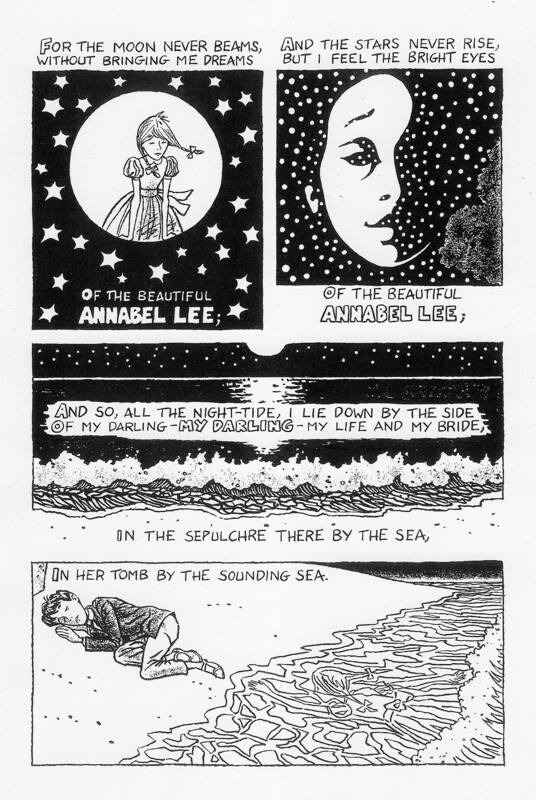 love annabel’s presence among the waves in the last frame. Great work Julian!! Prufrock bought me here also. So inspiring. 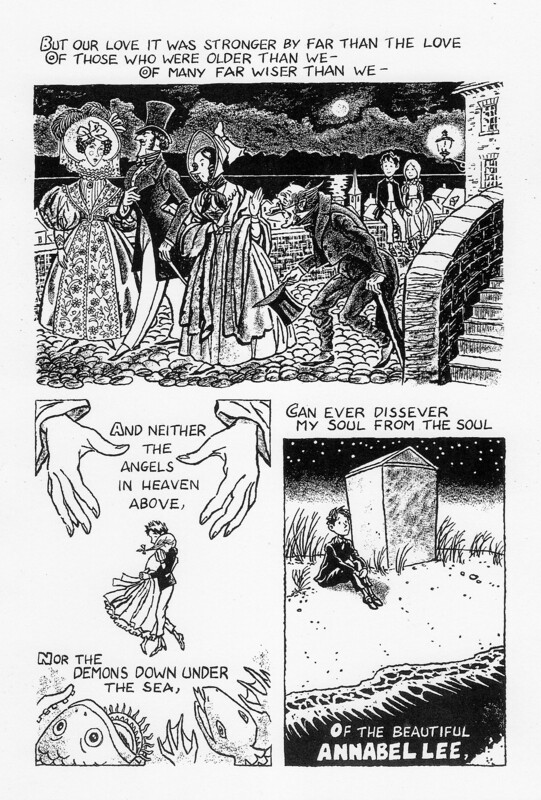 If you get a spare moment check out a poem called “The Highwayman’ by Alfred Noyes with illustrations by Charles Keeping(link below). It was one of my fav’s as a child and similar to your creations. Wow! Charles Keeping’s drawings (which I was only vaguely aware of) are incredibly beautiful and inspiring. I’m flattered that you would compare my work to his. This is awesome! One of my all time favorite poems and I love what you did with it! Thanks for sharing. Your work is absolutely beautiful! I also use this with my 7th/8th graders when we examine Poe’s work. I noticed that certain aspects seem to be inspired by gravestones from this cemetery: vhttp://www.thecarpetbagger.org/2013/05/charleston-sc-kingdom-by-sea.html. Did you visit here? I’ve been delving into the local Charleston folklore surrounding Annabel Lee Ravenel. Thank you! It’s so long ago that it’s hard for me to remember, but I think the tombstone in the title comes from a New England design. But a lot of the architecture was in fact inspired by a book of old photographs of Charleston. I’ve never visited though, unfortunately. One day, I hope! Hi Peter! I am a musician and i would like to use your art on youtube for a song i made with William Burroughs’ voice.Is that possible?Your name will be mentioned in description.Thanks in advance! Thanks for your interest, Aggelos, please contact me at info@jpeterscomics.com. Thanks! Julian, this is amazing! 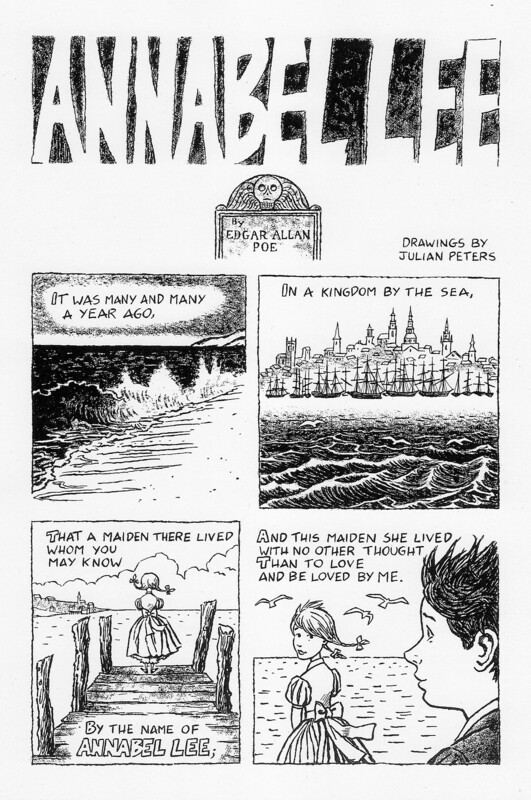 I am using your beautiful interpretation of Annabel Lee with my 8th grade students. They LOVE it as much as I do. Thanks Mandee! That’s great to know. Thanks for letting me know about this video. It’s interesting how much the imagery resembles that of my comic, albeit with an 80s glam twist! BTW, are you familiar with Fernando Pessoa’s beautiful translation of this poem into Portuguese? This comic is so old that it almost seems to me like something from Poe’s era! 🙂 It’s funny, it never occurred to me that the male narrator should be a lot older at the end of the poem, even though it’s being written in the present tense would indeed suggest that. Thanks Mark! That’s really great to know! These are beautiful! I’m gonna give them to my students tomorrow, I’m sure they’ll love it! Really nice work! Thanks! I hope they like them! This adaption is truly amazing. It captures the mood of the poem so well. When I looked at it, however, I couldn’t help wondering: Do you try to incorporate the poetic devices of the poem into your drawings (especially since Poe uses a lot of alliteration in this one. I feel this is something that cannot be drawn) or do you primarily try to convey the feeling the poem evokes? In any case… it is beautifully done! Thanks! I admit I can’t imagine how to illustrate alliteration, but I think I can find a visual equivalent to many many other poetic devices, such as similes, changes of tone, rhythm, and maybe even rhyme to a certain extent. Simply Wow!!! I had read this poem years ago and you have managed to translate it into images superbly. Your images bring out the pathos of the words. Hats off to you deepa!!! Simply Wow!! I had read this poem many years ago and somehow you have managed to bring the images I had in my mind exactly on paper. Thanks! Is there a way to purchase your comic in full? 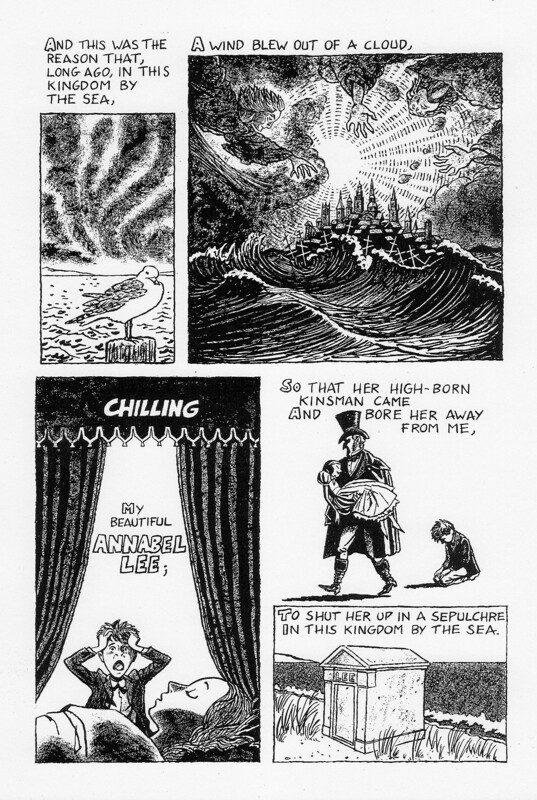 I really liked the comic edition to Edgar Allen Poe “Annabelle Lee” because it helped the reader imagine the time and place it could’ve been. The Art in each panel brought a new mood represented by the picture. I really liked it, and you should do more of these! This is a great poem. The rhyme scheme is clever but so are the pictures. The pictures helped me understand this a little better because the first I read it I couldn’t understand it. Great work! I feel as though that was a magnificent illustration of the poem, well done! This is a great illustration of the poem. 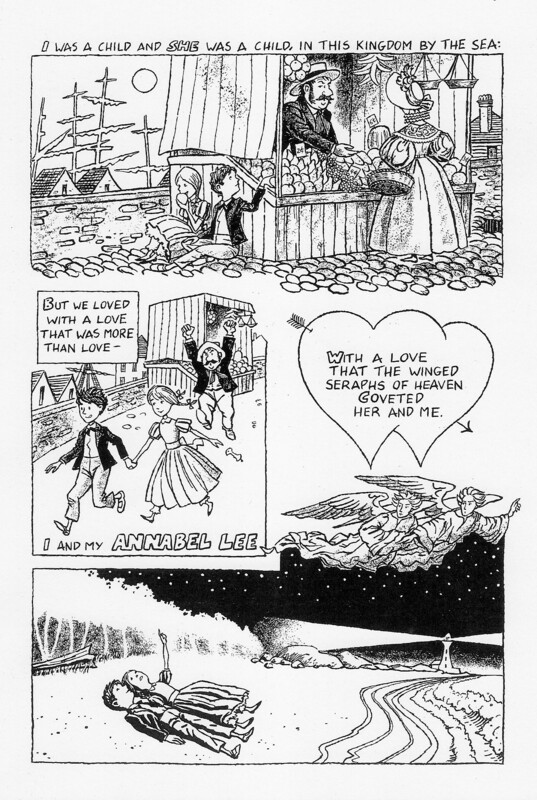 It captures the main details of the poem and I love how Annabel lee is hidden in the water in the last box. It truly shows the connection between the 2 characters and their love. I thought this was a beautiful way to show the poem. This showed that beautiful things can be sad too. Great Job! So true! In fact, most beautiful things are at least slightly sad, in a way. Pingback: “Annabel Lee” di Edgar A. Poe ora è anche un fumetto | Il fascino degli intellettuali. I just came across a post on Openculture and came over to check your work out. Simply wonderful. Just discovered you today, and have spent a wonderful few hours perusing and reading. Your work is amazing, and I will most certainly get any book of yours that would come out in print. As for the idea emitted, of putting your drawings up to see every day…. when will you be making posters? I’m so flattered that you have spent a few hours looking at my site! I love when I come across a site that makes me want to do that, and it’s very gratifying to think that this one could constitute such a space for someone else. As for the posters, that’s not a bad idea! I’ll have to look into it. Yes, posters for schools, I’ll share this with my students, thank you! These are amazing! Thank you so much for posting your work! Thanks! What better compliment could a visual artist ask for? Is there a way I could purchase a copy of this? Would love to see this, your T.S. Eliot work, and other literary interpretations in iBook form. I’d use them with my students. Are any of your poems available for purchase? If so, I’d love a list. I really somehow have this powerful internal need to hold them in my own hands and read them. And as for T.S. Eliot — well, I’m getting one, but I know it will be so desperately coveted that I need to get three, Help me out here. I’m ready to purchase! – C.
A beautiful rendition of this poem was made into a popular song by a group called the Co-eds. I always enjoy hearing it. I looked up the song, and found it on youtube. It really is beautiful! the best adaptation of the song into music that I’ve heard. The lovely melody, doo wop harmonies -not to mention the scratchy vinyl of this recording- really add to the wistfulness of Poe’s words. Thanks! It is your work is awesome. My father used to read this to me when I was younger and now I know it by heart. He used to read it to me before I went to bed. I miss hearing it. It’s one of my favorite poems now. My father passed away right before I went to college. This brought tears to my eyes because I miss my father a lot. When he read these poems to me and books it was so special to me. This poem means to much to me. When I read this it reminds me of him and I can hear him reading it. The art is beautiful and really conveys the unconditional love and loss in the poem. I would love to have a copy of it. Thanks, Christi. I’m glad my interpretation felt true to the strong meaning that the poem holds for you. This is so touching. My father used to read this to me when I was little. He would read this poem because it was one of his favorites. He knew it by heart and now I know it by heart. My father passed away right before I came to college and this has been so touching to read. The art is beautifully done and really conveys the love and loss in the poem. Thanks so much. It reminds me so much of my dad and I can hear him read the poem to me. Honestly, it brings tears to my eyes. Thanks. I’d love to have a copy of it. This is the most awesome thing I’ve seen on the Web in a long while. You, Sir, rock! Je suis en train de regarder tes dessins et je dois te dire que ton style me fait penser à ce que j’ai imaginé quand j’ai lu “Les Hauts de Hurlevent”! Il est simple et très évocateur… bonne continuation! fais-moi savoir si un jour tu illustres Emily Brontë! I ❤️ the cartoons!!!!!! It’s awesome the way you capture the sadness in the poem. I am very impressed with the last frame how you made the waves look like Annabel reaching out to touch the boy. Had no idea something so beautiful had a way of becoming even more so. The day this is available in print, I would be proud to bring it home. Good luck! Incredible illustrations. You’ve brought one of my favourite poems to life beautifully. Thank you. This is insane! I love this poem. Wow. You captured the intensity of their love so perfectly. Great stuff. I’d like very much to see what you’d do with my favorite poem — With Rue My Heart is Laden, by Housman. Your art style looks a lot like the comics Gerard Way draws! It looks really cool! I don’t know him, but I’ll check him out. Thanks! Thank you so much for this incredible work that you’ve done with this poem. It will be an innovative way to teach this poem to my students. I will be using it next semester.Other poem I teach are : “The Runaway” by Robert Frost, “The Highwayman” by Alfred Noyse and “maggie and milly and molly and may” by Lucille Clifton. Ah! I’ve always wanted to illustrate “The Highwayman,” at least the opening stanza, with the moon as a ghostly galleon, and the road as a ribbon of moonlight. So wonderful! this is my favorite poem of Poe, his the Master! and you… you became the perfect poem in something more Perfect! You make the cartoons just exacly as I imagine, thanks! for this wonderfull and amaing work! your the best! Wow you are truly amazing. Unique perspective, thank you. Thanks! Your encouragement is much appreciated. In Spain, in the south-west, in a region called Extremadura. Thanks a lot, I was ver worried for not being able to use them, thanks, thanks, and many thanks. Have a look! I made that last week with another group of students! Good stuff! I’ve always loved the name Extremadura, BTW. Sounds so tough! Sure, I’d be happy to have you use my drawings. Where is your school? Excellent work Jualian, can I use it for a project at school?? 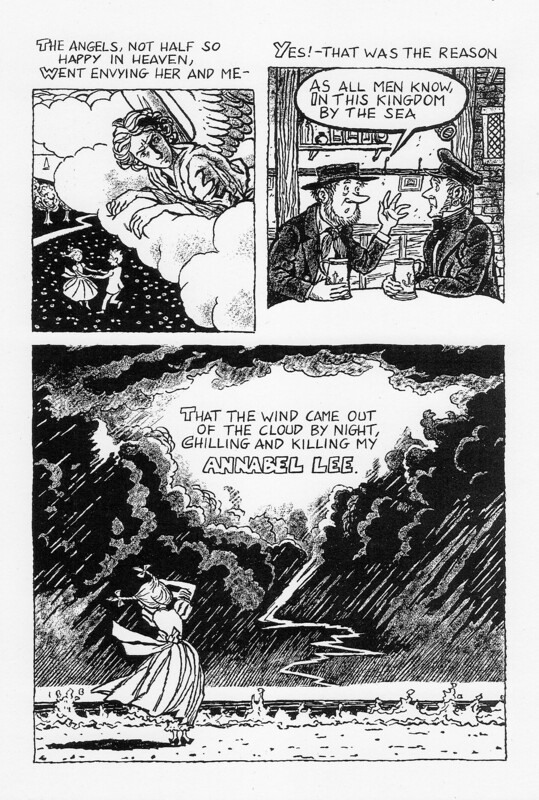 We’re preparing some stuff about Poe and I’d like to use use this comic because the illustrations are great! Is that possible? Thanks! By all means. I would just ask you to provide a link to my website somewhere in your project. In fact I’ve posted something like TO LEARN MORE, and I’ve included this blog. By the way, I’m just preparing it and the students have begun reading the poem and familiarizing with the topics and Poe’s way of composing. My idea is to create a poster for the classroom, and then to prepare your comic with some additional activities I will prepare. The school magazine has accepted (I’m a teacher of English) to publish a review of my project but I’m asking you if I can use your images. I’d be very delighted to show you the end of it, because I’d like them to colour your comic using Po’e way of depicting nature and the elements. Thanks a lot for your work! This is really well done. wonderful illustration for a wonderful poem. the students will love it, I think I’ll show it to them when we do our Poe study. Thanks a million (or given the amount of o’s, thanks a trillion)! Thanks! I’m not sure what the problem could be. Contact me at info@jpeterscomics.com, and I will send you a scan of the 3rd page. Amazing translation of the poem. Beautiful and inspired. Congrats. Wow. My name is Annabel and it is even spelled the same. The poem is really sad, Great job anyway!!! Love it!!!! Thanks! It’s a lovely name!